welcome to the australian wikki website! Wikki Stix has been a success trusted by kids, families, teachers, educators, carers and many others for over twenty years. We are proud to have played our part in this success here in Australia for a number or those years. We hope you find what you are looking for on this website, let us know if we can help in any way! 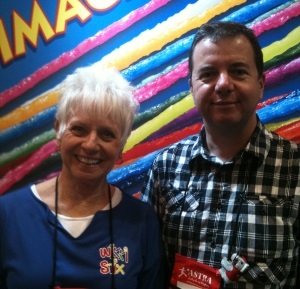 Luc (Luke) Marin, Founder and MD of Eureka Concepts, the exclusive distributor of Wikki Stix in Australia, meeting with Kem Clark, President of Wikki Stix Corporation. NEW RANGE OF SENSEEZ VIBRATING CUSHIONS FOR KIDS. VISIT OUR DEDICATED SITE!